A Nevada trucking company has been refused a retrial stemming from a fatal 2011 accident in which an Amtrak train was struck by a truck along U.S. 95, causing the deaths of 6 people, including the trucker, according to a report in The Salt Lake Tribune. In 2014, a jury ruled in favor of Amtrak and ordered that the fleet pay more than $4.5 million in damages. John Davis Trucking was found at fault based on testimony from the National Transportation Safety Board investigation. That testimony contended that the driver was inattentive and the truck had poorly maintained brakes, which likely contributed to the crash. 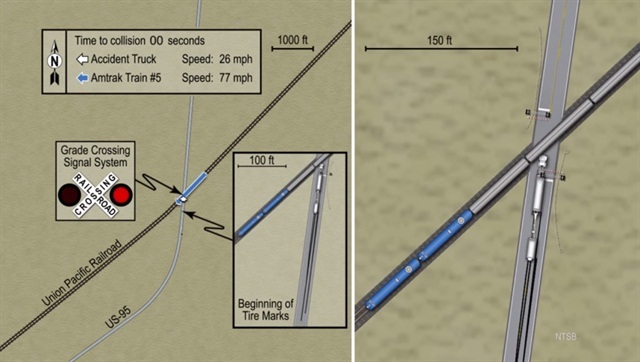 John Davis Trucking was seeking a new trial, arguing that the judge in the original case failed to emphasize evidence that the signal and crossing gate at the railroad crossing were faulty. However, the federal judge felt that the trucking company had received a fair trial and that its new arguments were only rehashing old arguments that the court had already decided on. The collision destroyed the truck and several passenger railcars. It also ignited a fire that engulfed two railcars and part of a third. The accident killed the truck driver, the conductor, four passengers and injured 15 more. According to the NTSB investigation, the truck was traveling 58 mph and failed to brake until it was less than 300 feet from the crossing. Investigators determined that the truck was still going 26-30 mph when it struck the crew car of the train. Nine of the 16 brakes on the truck were found to be out of adjustment or inoperative at the time of the accident and the antilock brakes of both trailers were not functioning.